The official fuel-economy estimates for the 2015 Ford F-150 have been announced at a press conference today: up to 26 MPG on the highway with the 2.7 EcoBoost engine. Here are the EPA fuel economy claims for the 2.7 EcoBoost, 3.5 EcoBoost, 3.5 V6, and 5.0 V8 in Ford's new aluminum truck. *Max towing figured assume "towing package" opted for. In field testing, Doug DeMuro and I got around 18 MPG driving the 2.7 EcoBoost like "normal people." I squeezed 23.5 out of it hypermiling and infuriating my passengers. Ford says they're still stalwartly leaving diesel alone on the 2015 F-150, basically because it's more expensive at the pump. As Ford's charts here substantiates, F-150 customers have been moving to smaller engines... a trend they're going to keep encouraging with improved tech in small-displacement power plants like the 2.7 EcoBoost. 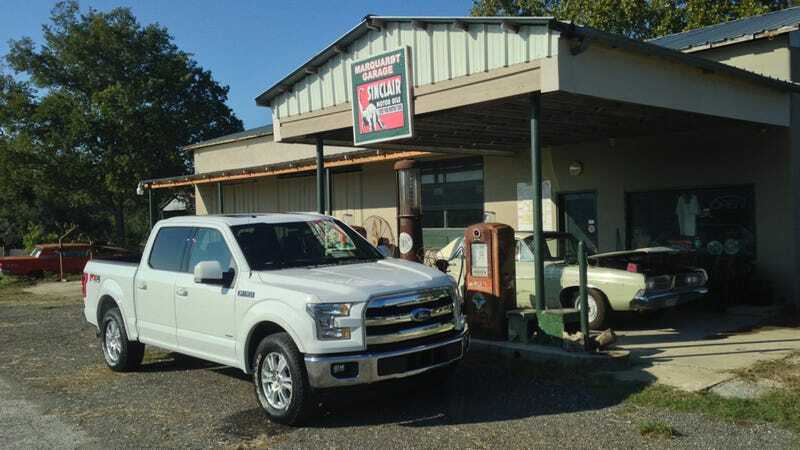 The 2015 Ford F-150 is going on sale right about now; Ford's Group Vice President Raj Nair says "the first customers will be taking delivery as soon as next week." More 2015 F-150 specs and stories; on price, capability, and power.